The colored wheel surrounding the Bodygraph is called the Mandala. It is subdivided into 64 partitions that represent Gates. 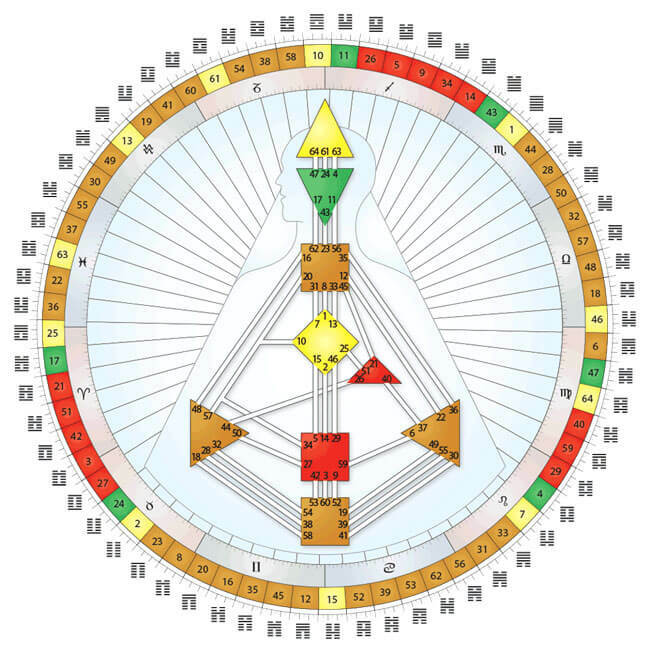 The 64 Gates correspond to the 64 Hexgrams of the I'Ching. Each Gate number has a fixed location in the Bodygraph and the Mandala. The Gates are color coded to match the color of the Center that they are connected to. Each Gate is divided into six sub-sections called Lines. (These are the short notches within the arc of each Gate around the wheel). The inner wheel of the Mandala is sub-divided into the 12 astrological signs.